At The Designer Office our range of desks has been carefully chosen to offer the finest furniture solutions at affordable prices. Whether you are refurbishing your workplace or furnishing a new premises, our team of knowledgeable staff will offer you free help to plan and design your desk space areas. Our range of desks have been carefully selected from UK manufacturers, ensuring we offer quality products that meet the needs of a variety of workplace settings, such as call centres, offices, reception areas and education establishments. We provide styles of desks and design solutions that will complement your working environment, whether it be our Reception Desks, Cable Managed Desks, Office Pod Desks, Office Bench Desks or Executive Desks. Reception areas are often your first opportunity to make the right impression on your potential clients and business partners. 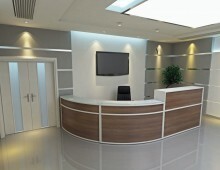 It is therefore imperative that your Reception Desk is attractive and in keeping with your corporate brand. The reception area must also offer clever storage solutions within a limited space to ensure your welcome area appears clear and organised. Our team of experts will help you explore our range of reception desk solutions, to find the perfect blend of style and practicality. 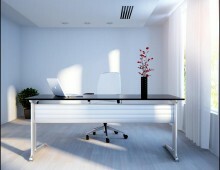 A tidy and organised office provides an ideal environment for increased productivity. The Qudos range of Cable Managed Desks effectively hides unsightly power cables and leads from office appliances, whilst also optimising work space. The available sizes, colour options and styles ensure that your desk areas fit into your working environment in a practical yet aesthetically pleasing manner. Office Bench Desks are a popular choice for call centres and offices, allowing flexibility in the layout of larger office work areas. The desks can be easily relocated, and additional components fitted such as privacy screens and accessory bars, to suit the changing needs of your business. Our office bench desks are both functional and stylish, reducing your furniture footprint and increasing your available office space. Desks are likely to be the largest item of furniture in your office and so their appearance and functionality is of utmost importance. Our range of Executive Desks addresses these requirements, enhancing your corporate identity with their design while also ensuring your practical needs are catered for. The Designer Office is proud to supply high quality executive desks that help to visually promote your professional integrity. 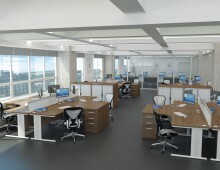 The Designer Office understands the importance of creating the right environment for your organisation. Our free planning and design service will help make sure your office desk solutions cater to your business needs, in the most stylish and affordable way. The full range of desks is also delivered and installed completely free of charge. While some of our range is represented on our website, the full catalogue of seating solutions is available by calling, 01902 886748.